Snow-covered evergreen trees are a complex subject to paint. There are so many branches and layers and angles - how do you know where to start? Here's a brief overview of the process. Just click to enlarge the tutorial. 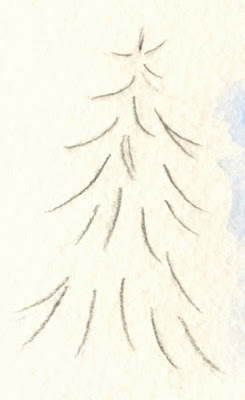 1 -The first step is to draw a skeleton of the tree branches with pencil. 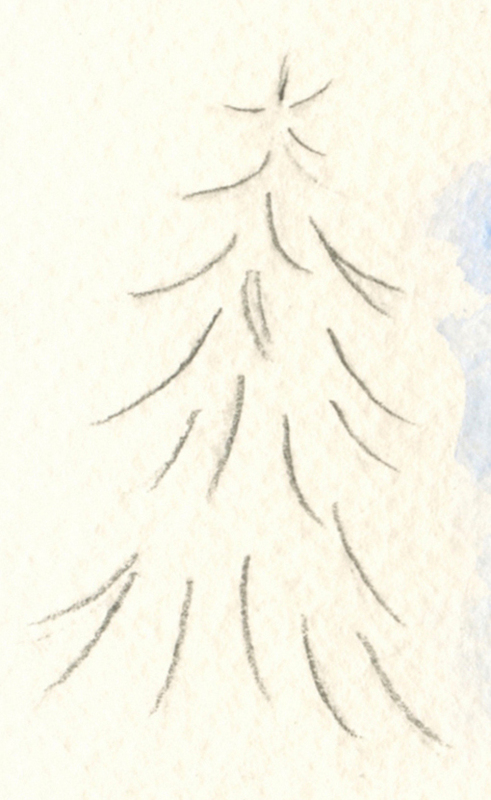 This will position the tree on the page and give us an idea of its size. No detail is required at this stage; we're just drawing lines to indicate the "backbone" of the branches. 2 - Next, paint the snow on the branches with masking fluid. 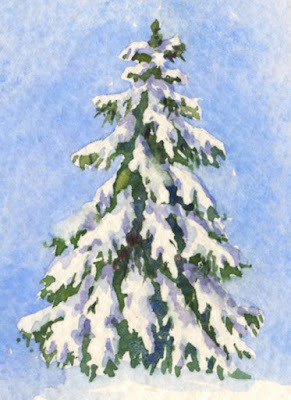 Vary the size and profile of the snow-covered branches to make them look natural. Let the masking fluid dry thoroughly, then wet the background and paint the sky. 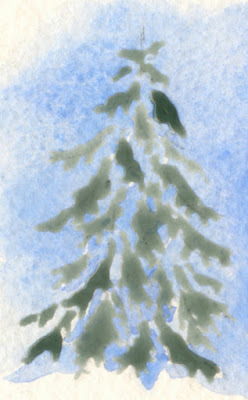 3 - After the sky has dried, it's time to paint the green twigs and branches. 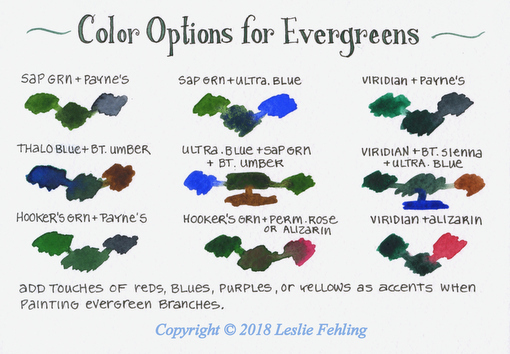 Here are some recipes for mixing the dark blue-green color that's typical of evergreen trees. Give them a try to see which ones you like best. Now paint the evergreen foliage that's between and below the masses of masked out snow. 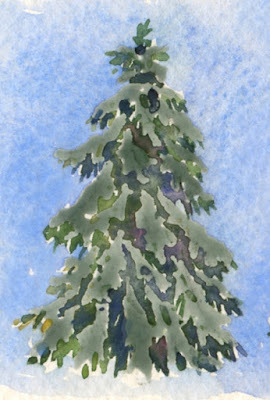 Along the outside edges of the tree, indicate twigs and branches with short brushstrokes. Notice, in my example, that I've used greens ranging from yellow-green on the left side where the sun is hitting the tree, to deep blue-green on the right side where it's more shaded. I allowed them to combine wet-in-wet on the paper, and also dropped in some purple while the paint was still wet. 4 - After the paint has dried thoroughly, remove the masking with a rubber cement pick-up or by rubbing it with your finger. Paint shadows on the snow using blue-gray and lavender colors in a range of values from very light to medium and dark. Add darker green, blue, or purple to the foliage where needed. Add other details to describe the setting, like cast shadows on the ground, etc. That's all there is to it! I hope you'll give these tutorials a try. If you have any questions, feel free to ask in a comment. 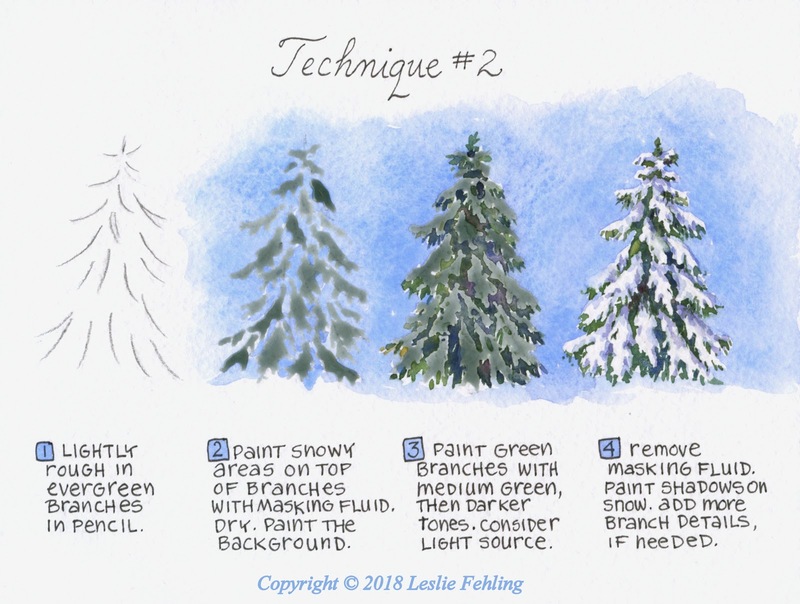 And remember, you can find lots of step-by-step watercolor tutorials on the "Tutorials" page here on the Everyday Artist blog. Enjoy! Thanks for the second tutorial! We’ll be heading to South Carolina in February, so I’ll get to experience some of that green grass and those blooming flowers you’re enjoying now. Can’t wait! Have a great time in Florida! Another helpful tutorial. I am curious--of the two methods, which do you prefer? I like #2 a lot, but I’m usually too impatient to do all that masking. I tend to just dive in and do it with technique #1.